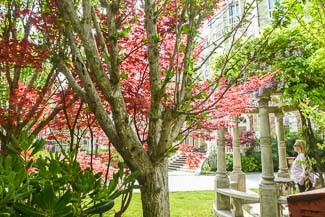 ABOVE: Spring blossoms add color to the garden of the Grande Albergo Ausonia & Hungaria, an historic four-star hotel on the Lido's main shopping street, the Gran Viale Santa Maria Elisabetta. To check for lowest available rates, click the hotel links or buttons below. Pets are welcome (with no extra charges) at this popular 60-room hotel on the Lido's waterfront. Rooms include singles, doubles, triples, and quads. The following hotels are a few minutes inland from waterbus station on foot. They're located directly on the island's main shopping street, the Gran Viale Santa Maria Elisabetta, which runs directly from the boat stop to the Lido's public beach over level ground. This 54-room hotel is in the heart of the Lido's business district, in a location that's busy in the daytime but quiet at night. It has a comfortable lobby, a bar, and private parking. The waterbus station is only two blocks away.